Isaac had called. I remember hearing something about a bridge. A bridge on 35 had collapsed. Turn on channel 9. We had no idea what we were seeing, confused, the TV signal came in and out, we had no idea what we were looking at. Then it all came into perspective. They panned the camera overhead and it was shocking. Cars, buses, semis, fires, and rescue workers dotted the screen. I had almost taken the bridge to work a few hours before but traffic had been backed up since 3:30 p.m. Suddenly panicked thoughts of friends and family flooded my mind. The phone lines were backed up with a storm of calls in the area. The news correspondent on T.V. urged viewers to leave the phone lines open for emergency calls. Text messages seemed to go through. I was relieved to hear that my family was alright. Abby was alright. The people I knew were all alright. Everyone- almost everyone was alright. I got a call from Mike at the Daily. He was calling all of the employees to make sure that everyone was safe. I wouldn’t have wanted to be anywhere else for that moment. I was at home, with friends, watching in sadness, leaning on each other, on blankets. Melanie was taking the blinds down. I’m really glad she was there too. It was like being with family, and she was that comforting motherly figure in the house. Christine got a message from a strange number. “617, where is that?” I reached for my laptop and typed, 617 area code. For some reason at that moment, we all sat in a dazed wonder at how quickly the world seemed to hear of the tragedy. There we were, glazed eyes for the next hour. The phones rang, text messages beeped, and the news rattled on. The night felt odd. I hardly knew how to feel, how to react. It wasn’t real. We went to the grocery store. We went to see John. We went to see Matt and Chris. We went to see the bridge. We had to. It still wasn’t real. I had forgotten how close Jim lived, he was right there, on the west side of I-35. “Can you see the bridge from your place?” I asked. “Im a block away. We heard it fall.” He stated. He heard it fall. Me and Amy sat in dismay. That’s something you can’t comprehend. Everyone that heard the bridge fall will know that sound for the rest of their lives. They’ll be able to describe it, but no one will ever really understand but the ones who experienced it. “Oh my god. I can’t even imagine.” I was stunned. It was just unreal. “We didn’t know until someone told us. It’s still crazy over here.” He shouted. At 3 a.m., Thursday morning my roommate and I drove near campus. “I never thought today would end like this.” I said. As we walked through the dewy grass, while flood lights illuminated the skyline and a hazy orange moon loomed over the river. We got back into the car and listened to melancholy songs as we drove closer. We were passing over University Avenue and the exit facing south on 35W. There it was, or wasn’t. Twisted steel and a rubble of concrete sat high above the wreckage, raised into the air at a 45 degree angle, the middle was torn from its trusses, gone, completely void. Cars tossed, some sank into the water, crunched. Students stared in awe and disbelief. After curiously attempting to observe sad vantage points, we headed home to sleep. It was eerie driving south on 35W, knowing that no traffic was or could be merging from behind, turning around and seeing stranded cars and flood lights and all of that gaping emptiness. I got on the 8:11 bus this morning. We turned northbound onto 35W. My eyes scanned the same page over and over, unable to concentrate. I couldn’t help but stare into the skyline. Hearing voices and stories about sisters and moms and the news from nearby seats, hearing sirens. Traffic was surprisingly calm. I walked off the elevator. Brendan at the front desk looked up, shook his head, “That’s fucked up. It’s just fucked up.” I nodded. “Yea, it is.” There was nothing else to say. Kristen came down the hall, her eyebrows raised. “CNN called me at 4:45 this morning.” They wanted to interview her. She lives a few blocks away in a high rise apartment building where she looked down at the recovery. She was on her way home after work, large rescue boats and emergency vehicles barreled down Washington Avenue. The bridge fell during her walk home. She rushed down and got to the scene at 6:20, before it was roped off. She brought her camera and was able to capture almost 150 pictures. Things like this are so surreal. 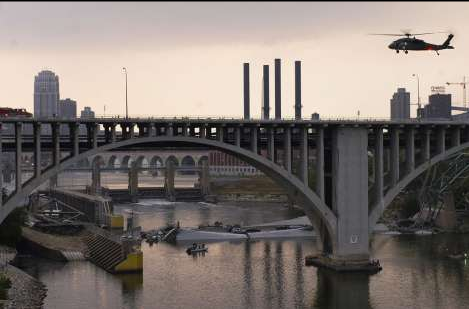 35W randomly collapsed into the Mississippi yesterday. That throws off your chain of events. We’re all fumbling around in our lives because of the choices we make, and then nature and gravity and chaos crumble without our choosing and disrupt the normality of life. Some become victims, some rise as heroes. And the awe of history and disaster cause not only the nation, but the world to pause and suddenly everyone is pulled from their daily struggles and self-minded problems. And for a few moments, for a few days, everyone cares a little more, everyone has a little more perspective and everyone is forced into the present. It’s not a one day tragedy. It’s right in the heart of our lives, of campus, of downtown, and it’s going to hang for months in it’s awe and destruction as a reminder of the unpredictability of life.